This is the band that made me want to go out and buy Rickenbacker guitars (and I ended up with two). In the aforementioned post from a couple of days ago, describing my discovery of modern day power pop and purchase of Not Lame's The World's Greatest Power Pop Compilation... Really, the very first cut on that album was this song, The Mop Top's "Plastic Moon Rain." Folks, I was truly forever sold when the first several seconds played. Ringing, slightly overdriven Rickenbacker guitars playing full out D major and A7 chords playing by themselves, with the drums pumping into the beat. Do you remember hearing all those guitars on Byrds songs like "Feel A Whole Lot Better" and "Mr. Tambourine Man" and Tom Petty classics like "Here Comes My Girl" and "The Waiting?" That's how it hit me then and it still sounds great now. And to encapsulate the perfect single, they speed it up at the end and bring in the tambourines, a trick that Todd Rundgren memorialized in the liner notes to his Something/Anything album. Yes, leave it to the Swedish once more to take a musical genre and perfect it. Those guys have always known their pop, whether it's the sweeping Euro style of ABBA or current production and songwriting behind Britney Spears and Ke$ha ("Tik Tok"), it seems catchy hooks are that country's major export. What is "Plastic Moon Rain?" I swear I think it's about death in some Frank Zappa kind of way. Magic world train, plastic moon rain. I feel no pain, plastic moon rain. You grow old, no hair to comb. So alone, in your heart and soul. Plastic, moon rain , Don't deny it, here it comes. Fall on me again, fall on me again. And who are these Mop Tops, who came up with their corny Beatles tribute name? According to their web site, they've been around since 1985, and their audience liked their "ruffleshirts, Chealseaboots, Vox amplifiers and swaying popbeat (all spelling theirs)." With a back catalog of 200 songs, they signed a deal with Velodrome Records in Gothenburg, and their album Inside was released. Contributing singles on a handful of compilations, the band only produced their second full album in 2008, Ground Floor Man. Inside is a Beatles-like Rickenbacker showcase, all deeply rooted in the Fab Four's early albums like Meet The Beatles, A Hard Day's Night, Help and Revolver. They don't mimic the Beatles, like the fictional Rutles, but employ the band's styles and instrumental simplicity, a real throwback when artists went for a jangly 60's sound with a quartet of instruments. Unfortunately, Inside is out of print. But what we do have is this outstanding song. The video takes photos from The Mop Tops' web site, when they played small clubs in a couple of rare New York City visits, visited a well-stocked music store selling (what else) Rickenbackers, and performed at Liverpool's Cavern Club for a Beatles fest. 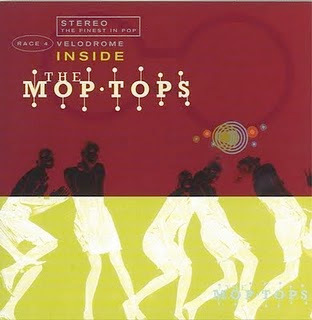 I just noticed that the Mop Top's Inside is available on Amazon in MP3 format.